Convicted murderer Alexander Blackman received a great deal of support at a recent appeal against his sentence. IN 2011, HEADCAM footage captured the moment when Royal Marine Alexander Blackman shot dead an already-wounded Taliban fighter in the chest. Two years later, Blackman became the first British soldier to be convicted of a murder since the Second World War. “There you are. Shuffle off this mortal coil … It’s nothing you wouldn’t do to us,” Blackman, paraphrasing Shakespeare’s Hamlet, was recorded as saying on 15 September 2011. The footage – captured on a camera mounted on the helmet of another soldier – showed what happened after the Royal Marine shot the Taliban fighter who had been seriously injured by fire from an Apache helicopter in the Helmand province. “Obviously this doesn’t go anywhere, fellas. I just broke the Geneva Convention,” he said to his fellow Royal Marines, in reference to international laws governing the treatment of prisoners of war. Following his conviction, Blackman was sentenced to life in prison, with a minimum period to be served of 10 years. This was reduced to eight years in 2014. The marine has received support from comrades and members of the armed forces – past and present – as well as from the Daily Mail and novelist Frederick Forsyth. Blackman was denied bail in December, pending his appeal, which is due to be heard by the court martial appeal court next week. His case was referred there after a judgement from the Criminal Cases Review Commission found that there was new evidence related to Blackman’s mental state at the time and that an alternative verdict of unlawful act manslaughter was not considered in the original case. A legal challenge by the Guardian and other media outlets called for footage from the head-cam showing the shooting to be made available. Media outlets had been keen to secure more video recordings of the incident ahead of Blackman’s appeal next week and, while they haven’t secured all of the footage, they have been granted several clips showing the build up to the incident, reports the Guardian. The Guardian, BBC, ITN, Times Newspapers and Sky argued in court that in the interests of “open justice”, all the footage should be made available. The Ministry of Defence and Blackman’s legal team objected to this view. The three judges ruled that two clips – one allegedly showing the marines dragging the injured man across a field and another of Blackman shooting him in the chest – could not be released. The footage that will not be released includes Blackman quoting Shakespeare and referencing the Geneva convention. The transcripts have already been made available. However, footage will be made available of a group of marines watching as an Apache helicopter opens fire on the suspected Taliban fighter. The marines are said to initially express their delight, which then turns to disgust when they realise the Taliban fighter is still alive. One marine asks why a different form of missile wasn’t used, while another man can be heard saying “shambles” in a separate clip. The third clip shows the marines walking into the field to inspect the injured man. It is not yet known when the footage will be released. 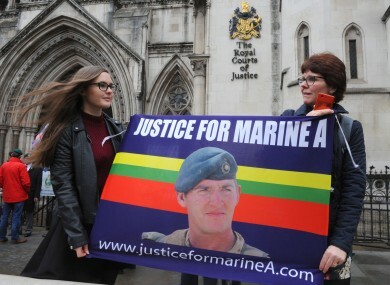 Email “Court allows partial release of video showing British soldier murdering Taliban fighter”. Feedback on “Court allows partial release of video showing British soldier murdering Taliban fighter”.